I don't know since when I love to apply facial mask lol. I think the first time I purchased facial mask was when I went to Taiwan in 2011, and that is when I met with Beauty Diary lololll. Facial mask is the easiest beauty supply you could slap on your face. You could quickly get smooth and supple skin within 20 minutes of letting it rest on your face. The best thing is facial masks gives you immense benefits. Each time you apply the facial mask onto your face, it helps to bring moisture and elasticity to your skin. Who doesn't want a "doink doink" skin?! The water from the facial mask absorbs deep into your skin and hydrates it. This directly makes you experience smooth and supple looking skin within minutes. For the cream textured mask, it allows you the privilege of control the amount and area where you apply the treatment. You could apply it just on your nose or forehead and even your cheeks without having to apply it on your whole face. Of course, another benefit of using a facial mask is that it gives you time to pamper yourself at home. After busying for whole day, home and relax on your bed with a facial mask on your face, and let the face mask elements absorbs into your skin. Close your eyes and maybe have a little quick nap while you are indulging in your spa at home treatment. The facial mask will cleanse your pores from dirt and remove stains from your face smoothly. Definitely you will feel absolutely great and rejuvenated afterwards. Last but not least, the best thing of all it is not an expensive beauty product and suitable for you ladies who are on a tight budget. One piece of Sephora mask at only RM10 at Zalora!! :O Facial masks are the easiest and simplest beauty product you could use without much hassle. You do not have to burden yourself with the step to step guide of layering beauty products on top of each other as facial mask could be easily applied and washed off. NO TIME TO THINK!! If you are interested on giving facial mask as your essential beauty product, check out Zalora website as they offer a wide range of facial mask brands online. I think I should also choose one wash-off masks from Zalora and continue rescue my skin! You should too! 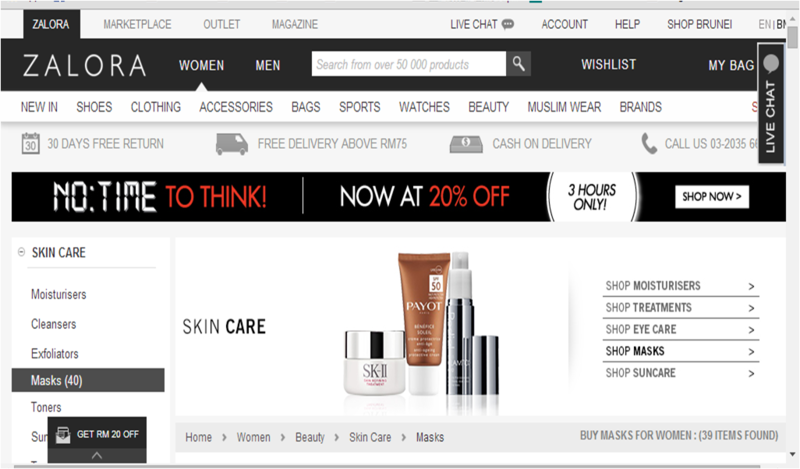 Choose one which fits you best and enjoy clear smooth skin by shopping online. Hurry up and shop now! Say yay to smooth skin!